Posted on Fri, Jan 27, 2012 : 12:15 p.m.
U.S. President Barack Obama addresses an enthusiastic crowd at the University of Michigan Friday. Below is the full text of President Barack Obama's speech in Ann Arbor today. 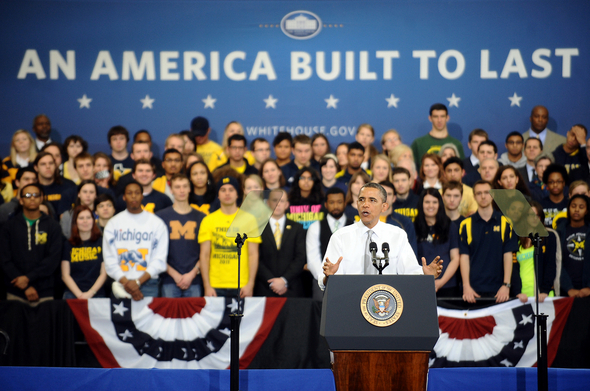 The president visited the University of Michigan to talk about college affordability. But the reason I'm here today -- in addition to meeting Denard Robinson -- (laughter) -- is to talk with all of you about what most of you do here every day -- and that is to think about how you can gain the skills and the training you need to succeed in this 21st century economy. And this is going to be one of the most important issues that not just you face, but this entire country faces: How can we make sure that everybody is getting the kind of education they need to personally succeed but also to build up this nation -- because in this economy, there is no greater predictor of individual success than a good education. And the degree you earn from Michigan will be the best tool you have to achieve that basic American promise -- the idea that if you work hard, if you are applying yourself, if you are doing the right thing, you can do well enough to raise a family and own a home and send your own kids to college, put away a little for retirement, create products or services -- be part of something that is adding value to this country and maybe changing the world. That's what you're striving for. That's what the American Dream is all about. Now, in the State of the Union on Tuesday, I laid out a blueprint that gets us there. Blueprint -- it's blue. (Laughter and applause.) That's no coincidence. I planned it that way, Michigan. (Laughter.) A blueprint for an economy that’s built to last. So our first step is rebuilding American manufacturing. And by the way, not all the jobs that have gone overseas are going to come back. We have to be realistic. And technology means that a larger and larger portion of you will work in the service sector as engineers and computer scientists. (Applause.) There you go. We got the engineering school -- there you go. (Applause.) And entrepreneurs. So there’s going to be a lot of activity in the service sector. But part of my argument, part of the argument of Michigan’s congressional delegation is that when manufacturing does well, then the entire economy does well. An economy built to last is also one where we control our energy needs. We don't let foreign countries control our energy supplies. Right now, America is producing more of our own oil than we were eight years ago. That's good news. (Applause.) As a percentage, we’re actually importing less than any time in the last 16 years. Audience member: Tell the First Lady we wish her happy birthday! The point is, this country has always made a commitment to put a good education within the reach of all who are willing to work for it, and that’s part of what helped to create this economic miracle and build the largest middle class in history. And this precedes even college. I mean, we were -- we helped to begin the movement in industrialized countries to create public schools, public high schools, understanding that as people are moving from an agricultural sector to an industrial sector, they were going to need training. Now, we still have, by far, the best network of colleges and universities in the world. Nobody else comes close. Nobody else comes close. (Applause.) But the challenge is it's getting tougher and tougher to afford it. Since most of you were born, tuition and fees have more than doubled. That forces students like you to take out more loans and rack up more debt. So we've got to do something to help families be able to afford -- and students to be able to afford -- this higher education. We've all got a responsibility here. So that’s what we’ve been doing. Now Congress has to do more. Congress needs to do more. They need to stop the interest rates on student loans from doubling this July. That's what’s scheduled to happen if Congress doesn't act. That would not be good for you. (Laughter.) So you should let your members of Congress know: Don't do that. Don't do it. Don't do it. Now, states also have to do their part. I was talking to your president -- and this is true all across the country -- states have to do their part by making higher education a higher priority in their budgets. (Applause.) Last year, over 40 states cut their higher education spending -- 40 states cut their higher education budget. And we know that these state budget cuts have been the largest factor in tuition increases at public colleges over the past decade. So we’re challenging states: Take responsibility as well on this issue. (Applause.) What we’re doing is, today we’re going to launch a Race to the Top for college affordability. We’re telling the states, if you can find new ways to bring down the cost of college and make it easier for more students to graduate, we’ll help you do it. We will give you additional federal support if you are doing a good job of making sure that all of you aren’t loaded up with debt when you graduate from college. (Applause.) And, finally, today I’m also calling for a new report card for colleges. Parents like getting report cards. I know you guys may not always look forward to it. (Laughter.) But we parents, we like to know what you’re doing. From now on, parents and students deserve to know how a college is doing -- how affordable is it, how well are its students doing? We want you to know how well a car stacks up before you buy it. You should know how well a college stacks up. We call this -- one of the things that we’re doing at the Consumer Finance Protection Board that I just set up with Richard Cordray -- (applause) -- is to make sure that young people understand the financing of colleges. He calls it, “Know Before You Owe.” (Laughter.) Know before you owe. So we want to push more information out so consumers can make good choices, so you as consumers of higher education understand what it is that you’re getting. And you know what else it means? It means that we renew the American values of fair play and shared responsibility. (Applause.) Shared responsibility. I talked about this at the State of the Union. We’ve got to make sure that as we’re paying for the investments of the future that everybody is doing their part, that we’re looking out for middle-class families and not just those at the top. The first thing that means is making sure taxes don’t go up on 160 million working Americans at the end of next month. (Applause.) People can’t afford to lose $40 out of every paycheck. Not right now. Students who are working certainly can’t afford it. Now, in the longer run, we’re also going to have to reduce our deficit. We’ve got to invest in our future and we’ve got to reduce our deficit. And to do both, we’ve got to make some choices. Let me give you some examples. Audience member: That's not fair. Obama: That's not fair. A quarter of all millionaires pay lower tax rates than millions of middle-class households. Obama: Not fair. Warren Buffett pays a lower tax rate than his secretary. I know because she was at the State of the Union. She told me. (Laughter.) Is that fair? Obama: Does it make sense to you? Those are the choices we've got to make. We can't do everything. We can't reduce our deficit and make the investments we need at the same time, and keep tax breaks for folks who don't need them and weren't even asking for them -- well, some of them were asking for them. I wasn't asking for them. (Laughter.) We've got to choose. This is part of the idea of shared responsibility. I know a lot of folks have been running around calling this class warfare. I think asking a billionaire to pay at least as much as his secretary in taxes is just common sense. (Applause.) Yesterday, Bill Gates said he doesn't think people like him are paying enough in taxes. I promise you, Warren Buffett is doing fine, Bill Gates is doing fine, I’m doing fine. We don't need more tax breaks. There are a lot of families out there who are struggling, who’ve seen their wages stall, and the cost of everything from a college education to groceries and food have gone up. You’re the ones who need that. You’re the ones who need help. And we can't do both. There have been some who have been saying, well, the only reason you’re saying that is because you're trying to stir people up, make them envious of the rich. People don't envy the rich. When people talk about me paying my fair share of taxes, or Bill Gates or Warren Buffett paying their fair share, the reason that they're talking about it is because they understand that when I get a tax break that I don't need, that the country can't afford, then one of two things are going to happen: Either the deficit will go up and ultimately you guys are going to have to pay for it, or alternatively, somebody else is going to foot the bill -- some senior who suddenly has to pay more for their Medicare, or some veteran who's not getting the help that they need readjusting after they have defended this country, or some student who’s suddenly having to pay higher interest rates on their student loans. We do not begrudge wealth in this country. I want everybody here to do well. We aspire to financial success. But we also understand that we’re not successful just by ourselves. We’re successful because somebody started the University of Michigan. (Applause.) We’re successful because somebody made an investment in all the federal research labs that created the Internet. We’re successful because we have an outstanding military -- that costs money. We’re successful because somebody built roads and bridges and laid broadband lines. And these things didn’t just happen on their own. Everybody here is only here because somebody somewhere down the road decided we’re going to think not just about ourselves, but about the future. We’ve got responsibilities, yes, to ourselves but also to each other. And now it’s our turn to be responsible. Now it’s our turn to leave an America that’s built to last. And I know we can do it. We’ve done it before and I know we can do it again because of you. When I meet young people all across this country, with energy and drive and vision, despite the fact that you’ve come of age during a difficult, tumultuous time in this world, it gives me hope. You inspire me. You’re here at Michigan because you believe in your future. You’re working hard. You’re putting in long hours -- hopefully some at the library. (Laughter.) Some of you are balancing a job at the same time. You know that doing big things isn’t always easy, but you’re not giving up. Thank you, everybody. God bless you. God bless the United States of America. Thank you. Sat, Jan 28, 2012 : 12:46 p.m. Sat, Jan 28, 2012 : 12:28 p.m.